Even more, I think that the brightness of such an irregular object, whose orientation is not easily ascertained, would be extremely hard to predict. I don't know what kind of algorithm is using heavens above, but my take is that brightness prediction would be feasible only for very simple -i.e. spherical and homogeneous- objects. In that case, I would say that there isn't much inconsistency in the narrative with respect to brightness. This may not hold for iridium flares, but I'll leave that discussion for a different thread. I don't think the irregularity of the shape of an object would make much difference with respect to brightness unless it exposed much greater surface area at certain angles. Consider a flat disk for example. Altair » November 7th, 2017, 5:05 am wrote: the brightness of such an irregular object, whose orientation is not easily ascertained, would be extremely hard to predict. Apparently all location, orientation, and path predictions by Heavens Above are based off the current "epoch" data, which is updated each day and shown on the ISS Orbit link. All their calculations are based on the current epoch, so the times and positions will be most accurate when close to that day, but if you look days or weeks before or after, it will be more inaccurate because the calculations aren't based on those epochs. I did some searching and found the current epoch data is apparently extracted from a much larger dataset given on the ISS TRAJECTORY DATA on NASA's website (yeah yeah, I know ), which contains a 2-week range of epoch data along with other technical information about the trajectory. Yes, I also know that... But the epoch data just tell you where the object will be at a given time. But nothing about its attitude relative to the observer, and that's a key parameter. The official version says the ISS it's mainly a tube-shaped object with lots of solar panels attached. Those should be always oriented to the Sun, while the main body of the ISS (according to the NASA footage) is kept horizontal with respect to the Earth's surface. So, the perceived luminosity would not be the same if you're looking at the tube from one of its ends (apparent surface would be almost 0) or you're seeing all its length. Also, when the panels are fully lit and in such an angle that most light is reflected to the observer. Or when you're looking at its lit side (let's suppose you have the Sun at your back, and the ISS in front of you) vs. when the ISS is between you and the Sun, so you'll be seeing mostly its dark side. To illustrate this, just imagine how different the luminosity of an alluminium paper roll would be depending on the angle you're looking at, and whether you're looking at its lit or shaded side. Altair » November 7th, 2017, 2:29 pm wrote: But the epoch data just tell you where the object will be at a given time. But nothing about its attitude relative to the observer, and that's a key parameter. It's orientation, or "attitude", seems to be kept generally constant, with the x-axis pointing along the velocity vector and the z-axis perpendicular to earth's center. The only time this might change is during docking maneuvers. Altair » November 7th, 2017, 2:29 pm wrote: The official version says the ISS it's mainly a tube-shaped object with lots of solar panels attached. Several tubes facing in different directions. Plus other appendages (besides the 'solar arrays'). Altair » November 7th, 2017, 2:29 pm wrote: So, the perceived luminosity would not be the same if you're looking at the tube from one of its ends (apparent surface would be almost 0) or you're seeing all its length. For only one tube, but again, there are several and they are oriented at right angles. Also the surfaces have some specularity (kind of like the dull side of aluminum foil) instead of being a perfect mirror finish, so incident light is reflected in more than one direction. Altair » November 7th, 2017, 2:29 pm wrote: when the ISS is between you and the Sun, so you'll be seeing mostly its dark side. And that's what the predicted brightness on Heavens Above shows: if its low on the horizon it is brighter when its in the opposite direction as the sun (ie, when seen in the East after sunset, or in the West before sunrise). When its in the same direction as the sun, its less bright although the sun's distance below the horizon is an important factor. NotRappaport » November 6th, 2017, 2:11 am wrote: Coming up on November 16 it will be visible at magnitude -3.9, and also pass almost directly overhead here in the Bay Area, California - this is the point where I will try to get video (using the above settings and magnification) of it. 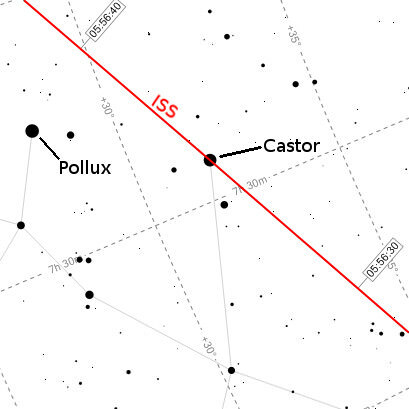 The path will perfectly intersect a particularly bright star, Castor (magnitude 1.9), that will be easier to see through the camera's viewfinder and center the view on - guaranteeing I will get the little bugger in frame as it flies past! It's also a nice high angle - about 65 degrees - where the "ISS" will be at a distance of 441 km, so it's angular diameter will 50.7 arcseconds. With a field of view of ~0.25 degrees (about 900 arcseconds) it will be as large as 5% of the frame size! All that remains to be seen is if the camera's sensor can get enough light within the 1/1000 second shutter speed to image it. "ISS" - stay on this path! Does it prove anything about the object's distance and size? Are you suggesting the object is at a higher altitude than we are told? That would be easily verifiable by some simple math assuming that the records on heavens-above.com are correct. Let me return the question with a question. Why did you interpret my question as a suggestion of higher altitude rather than lower? I don't understand the point about the shuttle. Can you explain that more clearly? Data can be fudged, to put it simply. And it seems, wherever people don't typically look, or from wherever data-fudgers try to deliberately push our vision away, there can be room for deception. It's just as simple as that. I am hoping that you will gain the ability to look critically at what you may be assuming is knowledge. If you are already on board with the possibility that the ISS deception is somewhat thorough in terms of the public information available about the "object", my point is moot. You are right, the data could be fake or manipulated, and the only thing which could give me any sort of confidence that it's accurate is if there are no trustworthy accounts of significant discrepancies between the predicted path and brightness of this object and the observed path and brightness. Since anyone observing the object is effectively randomly positioned with respect to the object, if any given person observes it to always follow its predicted path, there's good reason to believe anyone else in the world would, but the more people from the more locations who could verify the same thing, the more confidence one could have that the data is accurate. The trouble is finding trustworthy sources of people who are critically minded and who actively observe these things. Along this line of thought, I had noticed that a lot of the testimonies on amateur astronomy forums mentioned being "alerted" of a passing via a telecommunications application. I still suspect that perhaps the accuracy of the alerts is meant to deter anyone from questioning the rest of the data, but at this point that is still just a suspicion. 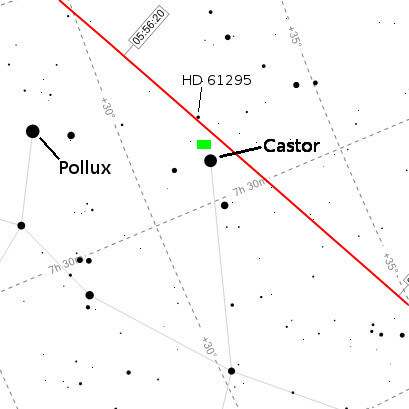 Well, as the epoch updates on Heavens Above, the November 16 path diverges further away from the bright star, Castor, I was hoping to use as a guide of where to center the view. To illustrate how big the telescope's field of view is, I've placed a tiny GREEN rectangle in the picture above Castor. Yes, that little green rectangle really is the total field of view I would have through the telescope. The "HD 61295" is the name of the tiny magnitude 6 star the path is now predicted to come close to. I don't know if I will be able to readily locate this star. If the path doesn't come close enough to a sufficiently bright star (one I can locate and identify through the viewfinder) such that both the star and the path will be within an area the size of that rectangle, I will have no indicators of whether or not I am aimed at the right spot. If the experiment subsequently produces a null result (black image), I would have no way of knowing if it was due to improper aim or insufficient light. I am determined to not waste an opportunity so if this turns out to be the case and there is no bright star to center the view along the path (I won't really know until the epoch is November 16), I have a backup experiment with slightly different parameters (not recording through the telescope) that will serve to verify the accuracy of the path charted by Heavens Above and possibly get some sort of information about the object's shape. The backup experiment will consist of the camera on a tripod with a 300mm zoom lens (field of view: about 4 degrees) that will take 10 pictures in rapid succession using 1/1000" shutter followed by a single long exposure with a 20 second shutter at a wider field of view (perhaps 20-30 degrees). All images will be taken in RAW mode so I can adjust light levels and such after the fact. The first 10 pictures are to see if I can squeeze out any detail at all about the object (very unlikely, as with a FOV of 4 degrees and 18 megapixel resolution it would only be about 17 pixels wide), while the long exposure will clearly show the path against the background stars (this will serve to verify the path information provided by Heavens Above). Once the camera starts the long exposure I will start trying to track the object through the telescope and hopefully get a look at good magnification with my own eyes. ...it's not so difficult to capture the ISS on film. All you need is some pretty standard, amateur photographic equipment - et voilà - you can snap fairly decent pictures of the ISS. In your e-mail exchanges, did she explain how she circumvented the difficulties NRpt is describing? Actually the answer to that can be found in the image metadata, which indicates it was taken with a Nikon Coolpix P900 - those handheld camera's have 2000mm super-zoom (83x magnification) so no bulky telescope required. If I had one of those cameras this process would be much simpler! For example, I could use the method of trying to actively track the object in a 1 degree FOV. The "tracking" method basically records the whole time while the photographer tries to get the thing in view as it moves across the sky. During an entire flyby lasting several minutes, you might only get a couple of frames that managed to capture it. Such a method isn't really as feasible when using a telescope with a 0.25 degree FOV unless the mount is really loose or fully customized (mine is neither). So I'm using the static method of aiming at a spot and waiting for it to pass there. The difficulty arises in locating the exact spot to be aimed. Here is a more detailed documentation of my setup, and also some new information about how I can use it after all, even if the flyby doesn't happen right in front of a bright star. These are the parts that allow me to connect the camera to the telescope. 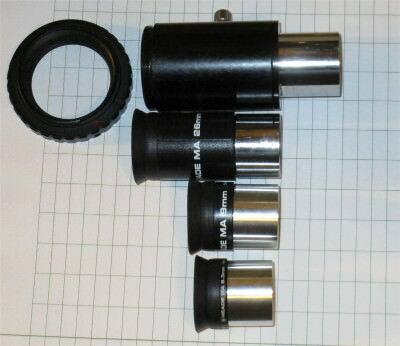 The t-ring (top pic, left) is made for Canon EOS cameras and the camera-mount (top pic, right) for Meade telescopes. The camera-mount screws into the t-ring (2nd pic), which attaches to the camera body (3rd pic), and the camera-mount's silvery end attaches to the telescope's eyepiece holder (bottom pic). I've encountered a couple of problems trying to use the eyepieces in this setup (and the setup as pictured will only work if there is an eyepiece in the tube, otherwise focus can never be achieved). One problem is obviously the length of the 26mm eyepiece compared to the tube - it fits, but with not enough room between it and the camera sensor to get consistent focus in the frame. The other problem is less obvious but it has to do with how far away the mount holds the eyepiece from the telescope's eyepiece holder. The added distance between eyepiece and holder increases the focal length enough that my 9mm eyepiece, which ordinarily provides 66x magnification, actually magnifies closer to 100x! That might seem like a good thing, but if you look at the Moon image I previously posted you'll see the sharpness is not very good at that magnification (the eyepiece just isn't made to show 100x magnification with clarity). And of course it causes the main difficulty I'm having which is an extremely narrow field of view of about 0.25°. This is much preferred because it means I can use the telescope with the camera after all without the limitations of an insanely narrow (and blurry) 0.25° field of view. The magnification will be less, but the resulting image will be much sharper. I will also be able to snap hi-res pictures instead of just taking video (although I could do that too). The light gathering will also be superior, meaning I can hopefully get away with a smaller ISO (maybe 800?). I'd love to get some more Moon pictures with this setup, but unfortunately the moon doesn't rise now until way past midnight, plus it's at waning crescent phase, so not very full. Too bad I didn't figure this out a week ago. If the 16-Nov flyby doesn't work out due to clouds or whatever, there's another chance on the 17th. After that there will be good passes in the early evening (thank god!!!) on the 26th, 27th and 29th. This is an excellent start to documenting the set up. Thank you, NotRappaport. I wonder if you wouldn't mind also getting some kind of picture of the set up with tripod and so on, as you wait for the exact target time (don't forget Daylight Savings ended recently!) A geolocation we can find on Google (after the fact may be preferred) would also be quite thorough. Do you mind also please (re)posting the web site you use for tracking time and location of the ISS? Eventually, we might want to create a special pinned thread where we can put certain interesting "CluesForum documents" together with all this data.